The mysteries of the moon's origins just got stranger, with a new study suggesting that the moon is either younger than thought or has evolved much differently over time. Currently, scientists estimate that the moon formed about 4.5 billion years ago in the aftermath of a titanic clash between a Mars-size object and Earth. Many researchers have suggested the newborn moon's molten crust solidified after just tens of thousands to a few million years, but not everyone believes it cooled that rapidly. To determine the ages of these ferroan anorthosites, the researchers analyzed isotopes of lead, samarium and neodymium within carefully purified samples of these rocks. All isotopes of an element have the same number of protons, but differ from each other in how many neutrons they have. Unstable isotopes of an element decay into isotopes of other elements over time, and measuring the proportions of various isotopes within materials can thus shed light on how old they are. "After many years of trying, we have found a way to reliably date the ages of lunar crustal rocks with high precision," said study lead author Lars Borg, a planetary scientist at the Lawrence Livermore National Laboratory in California. "We can apply this technique to address many questions regarding the timing of ancient events on the moon." This photo shows a moon rock collected during NASA's Apollo lunar landings. 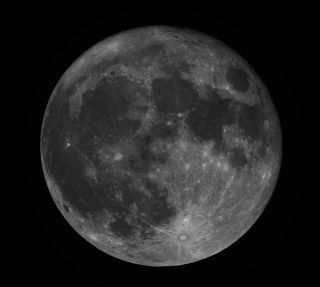 New research based on studies of lunar samples suggests the moon may be younger than thought, or formed differently that theories have indicated, scientists say. Instead, perhaps the lunar crust "formed over an extended period of time through the crystallization of small pods of magma, much like the Earth's crust forms now," Borg told SPACE.com. A different group of scientists recently suggested that Earth once had a second moon that crashed into our surviving moon. "This scenario could account for apparent age variations for ferroan anorthosites," Borg said. It remains uncertain how representative this lone sample of rock is of the geological history of the moon. "Lunar science is limited by the amount of samples we have," Borg said. The scientists detailed their findings online Aug. 17 in the journal Nature.